Dr. Keene received his undergraduate degree in Animal Science from Montana State University in 1980, and graduated from the veterinary school of Colorado State University in 1983. He went on to practice in California, focusing on equine health, reproduction and surgery. Since 1985, Dr, Keene has served as consultant to many veterinary and equine research companies, and on several committees of the American Association of Equine Practitioners. Traveller's Rest Equine Elders Sanctuary is looking for artificial Christmas trees in search of new jobs. Any size or shape is fine, but we do ask that the trees be in good condition. If an idea to generate support works out, the trees will be on display in area business, so they must look nice. If you have an extra tree please let us know , preferably before Thanksgiving, so we'll have time to coordinate other aspects of the program based on number of trees available. "At what age should I retire my horse?" We hear that question often and I wouldn't touch it with a ten-foot pole. I'll just say that there is no magic number. You should retire your horse when he no longer enjoys his work. Elmer Bandit....our hero! 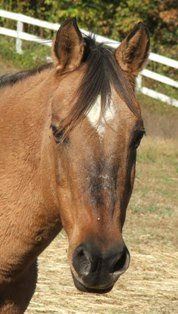 Many senior horses' owners have followed Elmer for many months as he approached the competitive trail mileage record. In Kansas, over the October 25-26 weekend, he did it. Elmer broke the old record of 20,710 career miles. As if that number wasn't impressive enough, here's another: Elmer broke that record at age 37! Be sure to read the article linked above, written by Marsha Hayes, who had a once-in-a-lifetime opportunity -- to ride her horse Ransom, next to Elmer during his record breaking ride. "Elmer Bandit is not scheduled to compete in any other events in 2008. " The November issue of The Virginia Horse Journal asked horses why they are thankful to live where they do. One of TREES residents is included in the feature. Horses are not interested in "Eastern Standard Time." Traveller's Rest would like to thank all who donated stall mats to the cause. Through no fault of his own, Rienzi is our biggest offender. 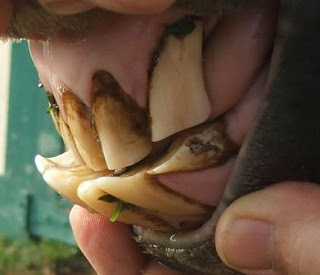 Not only does our clown prince have a serious malocclusion, but his previous home was a paddock he shared with goats and pigs. After picking up a mouthful of food, he still looks around to see whether or not his "roommates" are coming to share the meal. As you can see, this habit distributes his food in an impressive arc around the dish. 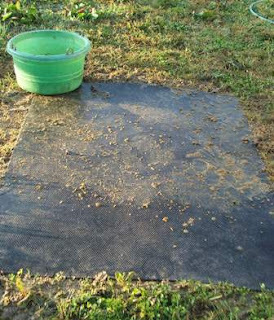 Here is Rienzi's mat after he decides he's vacuumed all he can. He does a pretty good job picking up the dropped food. 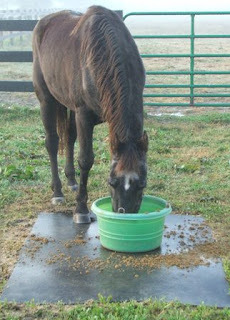 If he were eating on dirt or in a bedded stall, he would pick up a lot of debris with each meal. He is still pushing a lot of food off the edges of the mat, so we will need to dedicate two mats to this particular feeding station. The remaining mats will be cut into triangles that will fit in stall corners below the feeders. We'll still need to sweep up around feeding stations after meals, but this should make the job much easier in addition to providing a little more peace of mind concerning what is going into residents' stomachs.